Getting a job has never been very easy to anyone. But, do job boards work? Well, at present there are too many fake job boards or crowded job boards which are not that effective for seeking a job. Earlier, job boards where the only go to option for job seekers where one could find numerous valid job posts at one place. But today, because of the too much crowd in job boards and because of fake job seekers most of the organizations get into LinkedIn, one of the prominent websites which recruiters use to choose employees. Read this post carefully to know the reasons behind why job boards are not been an effective option any more. 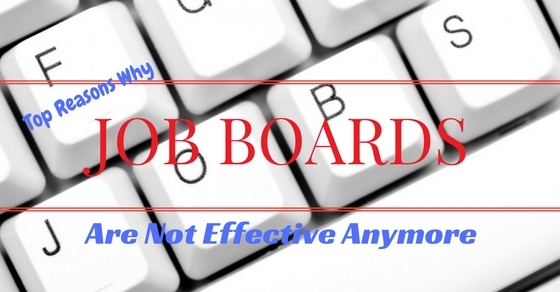 Job boards are still alive, but it is not been used as very effectively like before. Here are the few prominent reasons why they are not considered as the most prevalent method. Every now and then, there are new social media sites popping up which has better reach than age old job boards. Applying to a job has become very easy through these sites as it is just updating only about your strengths. And moreover recruiters find it easy to reach directly to the job seekers through no external source. Another prominent advantage is the news spreads easily and the response is very quick. For example, LinkedIn is a professional networking site where it clearly depicts the job seekers qualification in few steps away. Options like skill endorsements, clear picture of work history, and easy access to their profile at any time are making the employers switch to these kind of sources. In earlier days, job boards were the only option available for seeking jobs. Only few organizations had own official website and rest of them did not have websites on their own. So, employers would have only one option of getting help from job boards for their organization. Now it is totally different scenario, every organization has individual websites with a career section. So, they put up vacancies on their career section where job seekers directly apply through it and get hired. Hence, job boards lose their need in most of the organizations. Most of the job seekers who apply through job boards do not have any filter in applying to job posts. So, they tend to randomly post their resumes. This might be very uncomfortable for the recruiters to scrutinize the right candidates. Hence, recruiters generally take it as a vague option and narrow down only few resumes which comes first or some random selections because of the no relevant resumes posted through job boards. Generally job seekers do not have any particular restriction to only post to relevant vacancies. So, they maximum try to apply for most of the vacancies posted irrespective of the many specifications. And one more difficulty to the employers is job seekers are always more in number through job boards and only few are really worthy to get noticed. So, employers tend to scrutinize resume through automated software with certain filters of their choice like years of experience or skill set. So there are more chances being unnoticed from huge crowd from job boards. Most of the organizations have different methods of hiring. For example some of the prominent hiring techniques are through colleges for fresher, employee referral and job boards. Freshers are mostly hired from colleges, and after employee referral quota only few vacancies are left over for job boards. So, until and unless human resource department takes initiative to choose from job boards there is lot of time delay to get a reply. So, job seekers feel lots of time delay after applying for a job through job boards. Most of the job seekers once after applying tries to expect a mail very soon or a call from recruiters. As there is no direct communication from the recruiters they tend to lose hope and fails to update their resume in job boards. Or sometimes there are few cases where job seekers even after getting recruited they forget to remove their applications from job boards and because of the non-updated resume, recruiters tend to approach the job seekers. Because of these conveniences recruiters tend to not properly chose right employees and random selections have become common. Hence, missing opportunities are more common in job boards. Sometimes the salary scales for few job roles posted by the recruiters are not stable. They have a variation in scale which differs from the exact pay scale given. And nowadays job seekers also tend to choose good reputed organization than the less popular organizations. So, most of the job seekers feel salary scale posted in job boards are not up to expectations. And along with the salary scale, job seekers do expect a lot about stock options, employee benefits, and about the work culture. These things are not mentioned in the job boards by the employer which makes the job seekers to not depend upon the job boards. Employers have two common methods of reaching job seekers. They are cold calling and through email. And one common complaint from employers is that job seekers do not attend calls or tend to reject unknown calls often. Sometimes these types of mishaps even are faced by emails too. Job seekers either do not reply or respond very late to the organizations. Hence, employers feel difficult to get in touch with the job seekers. The market has huge competition for skilled people. And to survive in these competition employers has to hire very talented people. So they set huge expectations on the job seekers. It has become very difficult for the job seekers to get selected through job boards because employers feel resume cannot do much to choose the job seeker. Hence, job boards have been less priority for employers as well as employees as mere papers cannot support either employee or employer. There are many reputed staffing solutions popping up every day who acts as a third party to the recruiters for hiring the right candidates. They work through all means to help the recruiters to shortlist, to reach job seekers, conduct preliminary tests and even to negotiate about the pay scale too. Hence recruiters depend more upon these staffing solutions than job boards. Many times it happens that before the job vacancies go on job boards, they get circulated amongst the employees only. So the chance of getting the required job reduces to a greater level. You have much better chance of getting to the required job when it is informed directly. Direct decision can only be taken through the social media networking nowadays than the job boards. The job boards hardly provide outsiders an opportunity as the insiders themselves find the way to get their acquaintances to the job. As the jobs on the job boards do not get a platform to reach millions, the jobs remain confined only to the insiders or the employees within the company. So, it’s hard to reach the more skilled people outside the existing market. This is also a disadvantage to the company as no new talent is able to enter the company and the growth of the company remains stagnant. So, this is also one of the disadvantages of the job boards. However, nowadays the social media is way too active and almost all small and large scale companies resort to the platform of social media which is in fact a cool thing. The company is not able to grow if the employees within the company will remain within only. No new entry in the company can just stagnate the growth of the company as no new ideas would flow and no innovation would be there. So, if the companies wanted to get the new talent, they need to make use of the new talent and before that they need to give the new talent a chance. This is only possible when the job opportunities will get open for other than the insiders of the company. As said earlier too that social media is now the father of all activities being done, whether it is related to recruitment or enjoyment. Now every task is being performed on social media or say about the social networking sites. The work has become more easy by the networking sites and similarly the work of recruitment has also eased by the time. The professional sites reach millions at a time and the online recruiting has also replaced the job boards for the purpose of filling the vacancies. The job boards are no longer open job boards for the people aspiring for the job. This is because there is no longer sending of the resume to the companies and knowing every bit through the use of social media. The job openings are no longer able to reach maximum people at a time. The new trend is to send the open job positions to a small group of people who are well qualified candidates. By this way it becomes easy for the companies to know who is performing better and who is not performing well. Not just this, but also it just takes a click of button to send the emails or even to recruit. So, due to this reason too it is not effective for the companies to make use of the job boards for recruitment purpose. The job boards fail to work when it comes to abundant job openings. It is however not possible to send out job openings to several thousands of candidates as it no longer works now in the age of digitization. Even if a company makes a shift towards the job boards it is not at all easy to compete as the boards would probably require a larger rate of interest than other methods of recruitment. But, yes the recruiters would do well in order to develop strategy that includes different pipelines to differentiate the well qualified and less qualified people in the recruitment process. Only by this way the recruitment can be done properly otherwise the process of job boards is not at all preferred choice by the companies. Getting a job has become very tough nowadays as the market is very competitive and every single individual has started moving out of their comfortable zone to settle with a good responsible job offer. Better jobs reach people who only does extraordinary work on the ground than idle people who wait for opportunities to reach them. This scenario will no more support job boards as no more mere resumes or random applications will help the job seekers get a right job. A good networking contact with a proper skill set will always fetch job than waiting for jobs reach you with no effort. Even though job boards are still alive, it has not been a first option for recruiters as well as employees. Hope this post has helped to know the reasons behind why job boards aren’t effective anymmore.